Tackling the chores in a messy and dirty house can be overwhelming. There is so much that needs to be done that sometimes it is just easier to drop onto the couch and binge watch TV. Unfortunately, ignoring the chores won't make the mess go away. Setting up a list system of daily, weekly, monthly, and seasonally-needed chores will make housekeeping easier. Breaking down the tasks into small steps that can be done in just a few minutes each day will keep the mess under control. Dividing the chores between family members teaches responsibility and makes everyone's life better. Kids as young as three can begin to help with things like sorting clothes and toys. 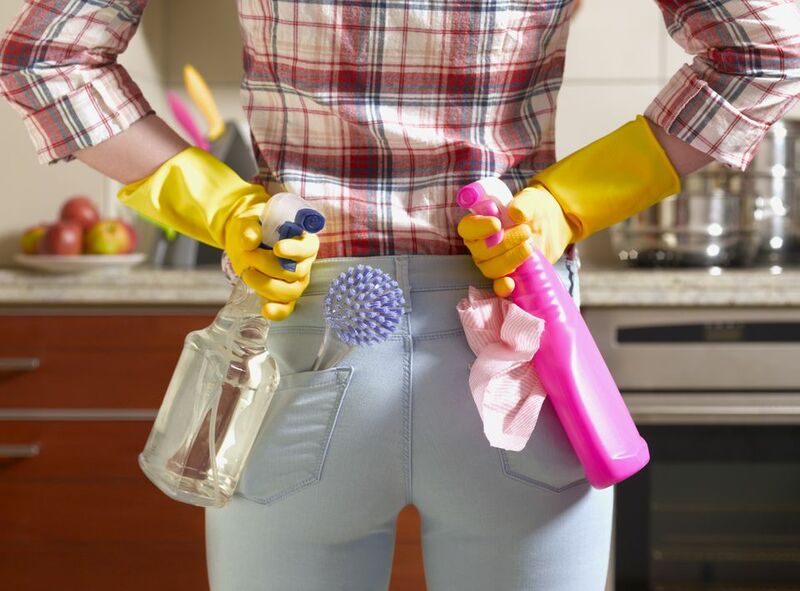 More good news, doing chores can count as exercise and help burn some calories. There are tasks that, if done daily, will keep your home in order and prevent that overwhelming feeling that everything is out of control. Some chores can be done first thing in the morning, some should be done throughout the day as you do other activities, and others can be done at night so that you wake up to an orderly home. Hand wash or load the dishwasher after every meal and snack. There should never be dirty dishes on the counter or in the sink. After any food preparation, put everything away and wipe down countertops and appliances to get rid of crumbs and spills. The kitchen is always full of activity and the floor shows it. Clean up any messy spills immediately and get rid of crumbs. Emptying or dealing with garbage each day will help keep away pests and leave a fresher smelling home. Fluff the pillows and choose bed linens that are easy for everyone to quickly spread up quickly. Place soiled clothing in a hamper. Return clean clothes and shoes to the closet or drawers. Depending on the needs of your household, laundry may need to be done daily. It is much easier to deal with one laundry load per day than seven loads at once. If cups or dishes have migrated to the bedroom, return them to the kitchen. Teach kids to put away toys and gather school-items needed for the next day. After each bath or shower, use a squeegie or towel to wipe down the walls of the shower stall, the doors, and the tub to prevent soap scum build-up and waterspotting. Close the shower curtain so it will dry more quickly. After each use, wipe the counters, faucets, and sinks with a disinfectant wipe or towel to remove spatters and spills. Be sure damp towels and bathmats are hung so they will dry as quickly as possible to prevent mildew. Before leaving a room, put away any books, dishes, toys that have been used. Wipe up or vacuum any spills from tables and floors. Immediately go through mail, schoolwork, periodicals and deal with them by reading, filing, or recycling. Since you've been following the list of daily chores, weekly chores should not be as daunting. Many are simply a more thorough job of the quick daily tasks you've been doing. There shouldn't be a mountain of mail, a sink full of dirty dishes, and a floor so sticky that you lose your shoes. Weekly chores don't all have to be done on a single day. Spread them out during the week so that you may just have a nearly chore-free day to relax. Use a disinfectant wipe to go over every surface (counters, sinks, appliance handles and touch screens, cabinet doors and hardware) to kill bacteria. Take the time to toss leftovers and spoiled foods. Wipe down shelves and bins with a disinfectant wipe. Give the kitchen floor a thorough cleaning. Change the sheets and wash any soiled bedding. If all of the dirty clothes are not in the hamper, gather clothes and sort to do laundry. Dust all surfaces and vacuum floors. Give every fixture (toilets, counters, sinks, bathtubs, shower stalls) a good scrubbing to remove bacteria and soap scum. Clean hair from all drains. Shine mirrors. Gather and wash all towels, bath mats, and shower curtains. Dust every flat surface and don't forget the tops of bookcases and fan blades. Vacuum or mop floors. Use a disinfectant wipe approved for electronic equipment to wipe down remotes and game controllers. Take a look at the items that have accumulated during the week that do not belong in that area. Toss or return them to their proper place. Now that you've master the daily and weekly chores that keep your home cleaner and more orderly, there are some monthly tasks that require a bit more time and effort. These deeper cleaning tasks make daily upkeep easier, help home furnishings look better and last longer, and reduce the allergens in your home. It's time to check the stovetop drip pans, the oven, and the range hood and filter and give them a good cleaning. If you haven't kept the refrigerator spill-free, give it a good cleaning as well. Using a coffeemaker? Clean it well to remove water scale. You'll have better tasting coffee. Think about the grease and food that ends up in the dishwasher. Give it a thorough cleaning monthly and you'll see better results and cleaner dishes. This is also a good time to clean another major appliance workhorse, your clothes washer. Even if you use heavy-duty trash bags, trash cans and recycling bins can get pretty grimey. Give them a good scrubbing with a disinfectant. Take some time to organize closets and drawers to keep clothes neat and wrinkle-free. Pull out any garments that need mending, sent to the dry cleaner, or donated to charity. If you haven't been vacuuming under the bed and all of the furniture weekly, now's the time to get rid of dust bunnies. If you have been doing daily and weekly cleaning, the bathroom should be in good shape. However, take a bit of time to clean and disinfect make-up and grooming tools, check for mold and mildew on grout and other surfaces, and really scrub away any soap scum. Give upholstered furniture a thorough vacuuming including under the cushions. Dust and polish wooden finishes and condition leather to keep it supple. Check fan blades, corners, and light fixtures for spiderwebs, dust, and dead insects. Take the time to move furniture and clean beneath and behind pieces. Light switches and the wall around them get lots of smudges and grime. Don't forget to dust door jambs, window ledges, and baseboards. Check the doormats both inside and outside entry areas. Give them a good cleaning to prevent dirt from being tracked into living spaces. Replace air filters and clean vents around your home. There are some chores that need only be done seasonally or just once per year. Stagger the chores so they get done but when it is convenient for you. Once or twice a year, go through cabinets and food storage and discard expired foods and donate or move out items like dishes and small appliances that you seldom use. A mattress should be thoroughly vacuumed each season to remove dust and dust mites. Clean bed pillows, bed coverings, and window treatments well. At least twice a year, empty closets and drawers and give them a good vacuuming and dusting. Sort clothing, accessories, and toys then toss or donate unused items. Go through beauty and first aid supplies and toss any expired products. Dispose of unused medications properly. Take time to look under the sink and around fixtures to catch any small leaks or drips. This will save you money and heartache later. Hire a professional or use a steam cleaner to clean carpets and large area rugs. Damp mop hardwood floors to maintain the shine. Couch and chair upholstery can usually use a thorough cleaning seasonally to remove stains and odors. Wash windows inside and outside. Vacuum window screens. Fireplaces and chimneys should be checked and cleaned yearly. It's good to check dry vents as well for lint build-up. Clean out gutters and drains around the house.